Major Nidal Malik Hasan's odd behavior – telling colleagues that the United States was at war with Islam, justifying suicide bombing and saying his religious loyalties outweighed his oath to protect America – provided ample justification to kick him out of the Army under existing policies. But a Senate committee report issued Thursday faults a culture of timidity toward violent Islamist extremism within the Department of Defense (DoD). That culture not only allowed Hasan to continue to serve as an Army psychiatrist, but contributed to glowing performance evaluations that helped the DoD and the FBI miss critical signs that Hasan was a "ticking time bomb." 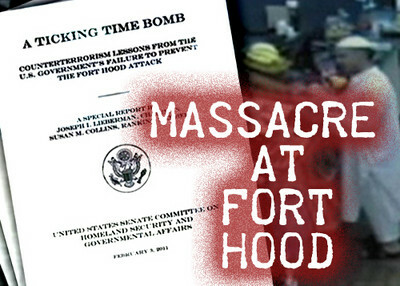 That bomb went off Nov. 5, 2009, when Hasan is accused of opening fire inside a Fort Hood processing center, killing 13 people and wounding 32 others. The Senate Committee on Homeland Security and Governmental Affairs report lists "a string of failures" which allowed "the deadliest terrorist attack within the United States since September 11, 2001" to take place. It offers a detailed narrative of Hasan's behavior leading up to the attack, most of which is already known, including his radical statements and communication with American-born al-Qaida cleric Anwar al-Awlaki. It repeatedly emphasizes the military's refusal to invoke the violent Islamist extremism that drove him to act, referring instead to mere violent extremism. "We are concerned that DoD's failure to address violent Islamist extremism by its name signals to the bureaucracy as a whole that the subject is taboo," the report said, "and raises the potential that DoD's actions to confront radicalization to violent Islamist extremism will be inefficient and ineffective." As evidence, Pentagon reports about the attack have avoided calling it a terrorist attack and failed to reference Hasan's radical Islamist ideology. Several of Hasan's peers complained about his radical statements, including those in presentations made as part of his medical residency. That included reaction to a 2007 talk called Is the War on Terror a War on Islam: An Islamic Perspective? It was interrupted after just two minutes after classmates "erupted in protest." The presentation justified suicide bombings, offered a defense of Osama bin Laden and said anger at America can be justified, the report said. Other officers reported that Hasan said "his religion took precedence over the U.S. Constitution he swore to support and defend as a U.S. military officer." After that, he proposed a study of Muslims in the military to see if they, too had religious conflicts. Among his proposed questions was whether "Islam creates an expectation that Muslim soldiers would help enemies of the United States in Iraq and Afghanistan." Hasan's evaluations mentioned none of this and he was not disciplined. He came off "as a star officer recommended for promotion to major, whose research on violent Islamist extremism would assist U.S. counterterrorism efforts." One officer blamed a combination of ignorance and political correctness, saying a fear of discrimination complaints prompted people to look the other way. But Hasan's superiors said they simply were not as concerned by Hasan's actions. Religion was part of his identity, the officer said, and some of his emotions were understandable. Hasan was scheduled for a deployment to Afghanistan in the fall of 2009, something the Senate report's authors found incredible. "In other words, despite Hasan's history of radicalization to violent Islamist extremism," the report said, "Hasan was scheduled for deployment to provide psychiatric care under stressful conditions in a combat zone in which the U.S. military is battling violent Islamist extremists." Hasan's positive evaluations contributed to the FBI's failure to pick up on the building threat. When investigators learned Hasan was communicating with Awlaki, they dismissed it as legitimate research into religious extremism by an Army psychologist. The report also faulted the FBI for communication failures between its field offices and headquarters regarding Hasan's communication with Awlaki. The investigation that was conducted focused on whether Hasan was engaged in terrorist activity, overlooking the issue of whether his outreach to Awlaki placed him on the path to radicalization and action. The Defense Department should beef up its educational and discrimination policies to draw a clear line between Muslims in uniform and people adhering to a violent Islamist ideology, the report recommends. That would help remove any pall of suspicion falling on thousands of Muslim Americans in uniform and would help commanders feel more confident should they have to address "displays of violent Islamist extremism among servicemembers." Read the full Senate Homeland Security and Governmental Affairs committee report here. Do you mean : " Unfortunately President G.W. or Obama have been willing in the past and present to avoid calling the ennemy by its name." ? Unfortunately President G.W. or Obama have been willing in the past and present to call the enemy by its name. The legacy for our children will further concessions to an enemy we refuse to publicly attack, and are trying to bring to the negotiating table without them fearing a defeat. Are nation is in steep decline for we have stopped being Americans.